Intrinsic Surveillance was established in 2002. We are based in St. Austell, Cornwall and work throughout the UK. 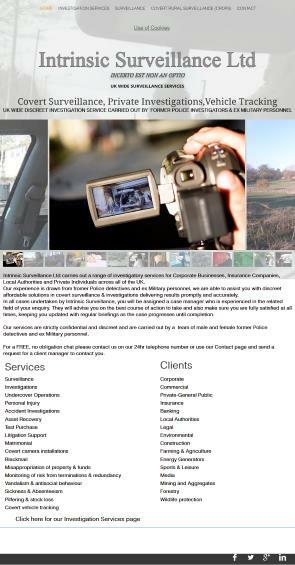 We are specialists in all forms of Covert Surveillance (Mobile, Foot, Static, Electronic & Covert CCTV) in both Urban and Rural environments. We deliver solid results in a timely and professional manner within your agreed budget. We take customer care seriously - it is our standard practice and second nature. Every instruction we receive from you is treated with the utmost importance and confidentiality. Your instructions, case or assignment will be assessed in detail to ensure we are totally conversant with your request before we start. This minimizes any risk of misunderstanding and allows us to proceed with clear and concise information. Our strength is in the provision of specialist services, providing the knowledge and expertise required to bring a commercial or corporate investigation to a satisfactory conclusion, empowering you with the knowledge needed to make an informed decision. To discuss your requirements contact Intrinsic Surveillance. Surveillance is an integral part of our approach to investigations. We understand the importance of getting it right; first time and every time. Mobile surveillance and foot surveillance. Male and female surveillance operatives are available, as well as multiple teams and an extensive range of observation vehicles from high powered motorcycles to covert camera vans. Rural Crime is an ever growing problem for all rural areas, with thieves targeting farm machinery, vehicles, heating oil, metal and livestock. At Intrinsic Surveillance we can deploy a surveillance team, covert CCTV or both to gather intelligence. This intelligence can provide the basis for a case to be put forward for a prosecution. To help in reducing or preventing such thefts we also provide a security survey service to advise on strengthening your site security. Intrinsic Surveillance is based in Cornwall and operates throughout Cornwall, South West England, and the UK to fulfill your requirements.